We can provide a list of Serial Numbers, and confirmation of the date and type of destruction service performed. We will provide a Certificate of Destruction that includes our full Guarantee. 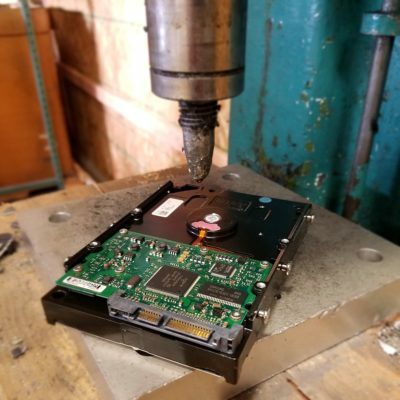 Utilizing our own 4 ton hydraulic press machine we are capable of puncturing and physically destroying hard drives and their internal platters, making them impossible to reuse or recover their data. If more destruction is required we have hard drive shredding capabilities that will tear your data devices into many small pieces just like paper in a paper shredder. We use advanced Department of Defense compliant software to wipe your data clean, by erasing, purging, and overwriting the drives multiple times, making the old data irrecoverable. Be advised that a drive must be functional in order to be “wiped”. Non-functional drives that can not be wiped will automatically be physically destroyed and degaussed. Just like shredding paper in a paper shredding machine we are able to shred hard drives to dust. Shredding is the ultimate and most extreme way in which we can destroy data. If your data needs to be terminate completely you can be guaranteed that shredding will make data be irrecoverable and gone for good. Degaussing is the process of exposing magnetic storage media like hard drives and tapes to a powerful magnetic field. When exposed to the degausser’s industrial level magnetic field the data stored as magnetic 0’s and 1’s on a tape or hard disk is neutralized, and erased. Hard drives are no longer usable after going through the process of degaussing and need to be recycled as scrap. Optionally, our Certificate of Destruction can include a full list of Serial Numbers with confirmation of the date and type of destruction performed on each. Call us today at (800) 282-3927 or email us at info@carecycler.com to discuss which destruction method best suits your needs and to receive a service quote.